FIRST AWAYhas a variety of fully coded MCA yachts to charter, based in Southampton, in varying sizes. Please click on the images below to visit the page of the yacht you are interested in. A well balanced boat which responds to the breeze with ease. A great spacious family cruiser that handles well. A great confidence builder, sparkling fun cruising. Equipped with heater, auto-pilot and C 80 chart plotter. Also 'AIS' enabled (Automatic Identification System) - letting you know what the 'big boats' are doing and where they are going! Ideal for Corporate Entertainment, team building and / or fast cruising. Brighten your sailing experience - sail this delightful yacht. A Beneteau 411. One of the most popular yachts from the Beneteau stable. Roomy, comfortable and fun to sail. Set her sails and let her go, distance not a problem as fully equipped with AIS, Radar and a large chart plotter at the helm - proven herself going trans-Atlantic and having fun exploring the Med. Charter her for a week or more and cruise Northern France, Channel Islands or South Coast of England. 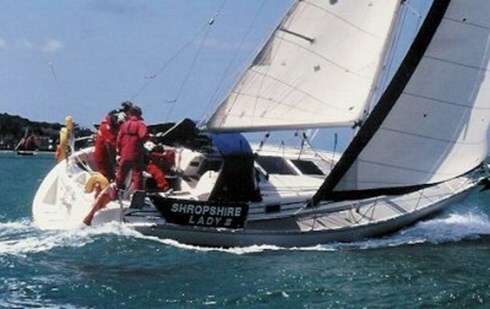 Great for Corporate Entertainment, team building or social events, sail her in the Beneteau Cup - you might win? With bags of room for friends and family, Nautical Dreams is a fun and stable cruiser, she is easy and comfortable to sail. She happily cuts along on the foresail but if you need a bit more exhilaration, hoist the main and she can show you what she can do. She is ideal for a family holiday, watching Cowes Week, Corporate Entertainment, or just plain ol cruisin’………. A well maintained and updated long distance crusing yacht. Designed buy Guy Ribadeau Dumas, she follows the concept of sea kindly, strong, traditionally built cruising yacht in which many have circumnavigated the world. She offers excellent sailing in the Solent with comfort always in mind, and has become a firm favourite of our customers. A Bavaria 350 that sleeps 8 is well set up for a comfortable sail around the Solent or along the South Coast. Coded for 8 people in 3 double cabins and well equipped for all keen sailors. Designed by Rob Humphries and built in Slovenia, she is more of a dark horse than a mere thoroughbred. She is nimble, tough, sea kindly and simply a joy to sail. Quick off the mark she boasts a warm wooden interior to welcome you inside, whilst all the time her performance tempts you to stay on deck and enjoy it all from the cockpit. Good instrumentation driven by a CP180 and current C-Card (Northern-Europe). Lazy jacks to take the strain with all but the topping lift led back to the cockpit. Come try her and you won't be disappointed. Southpoint II is a Bavaria 47 excellently equipped throughout, well suited to bareboat or skippered charters, training, team building and corporate charter in the Solent or further afield. Well appointed and capable Blue Water yacht. Spacious interior, 4 cabins, plus saloon, large cockpit and good sailing performance. Ideal for offshore cruising and corporate days! Great boat for Cowes Week entertainment.